★ What is it? VR-P25UD is a lightweight portable handheld RF amplifier. 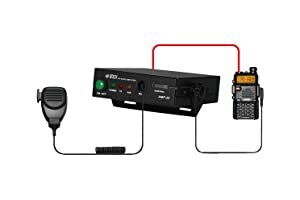 With this amplifier you can easily extend the communication range of a handheld radio. 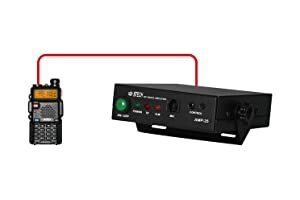 ★ Use the amplifier to create: a mobile device with a vehicle-mounted antenna, a powerful field radio with a field-installed antenna or a base station with an antenna on a mast. 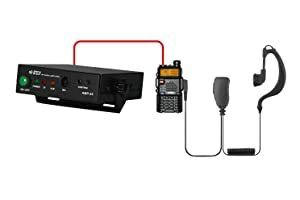 Your handheld radio connects and disconnects in seconds. ★ With an input power of 2-6 watts, up to 40 watts of output power can be achieved. ★ Suitable for TDMA mode in addition to FDMA (C4FM, D-Star, NXDN, IDAS, dPMR, P25, MPT1327, DMR Tier II). Supports analog and digital handheld radios, e.g. Baofeng, Radioddity, Kenwood, Yaesu, Motorola DMR radios. VR-P25UD is a lightweight portable handheld RF amplifier. With an input power of a handheld radio of 2-6 watts - up to 40 watts output power is possible.